Digging through my old photos, I found this meal I had back in January 2010. As usual, I was only in HK for a night. I flew up to HKG (on China Southern, ugh) after spending the 5 days prior in Cambodia, and I was flying over to Kaohsiung, Taiwan the following afternoon. This was only of my last few trips as a SkyTeam flyer, as I made the switch over to Star Alliance just a couple months later, and haven't looked back! I try not to overnight in HKG that often as its difficult to get a good hotel for a reasonable price. I aquired a few orphan SPG points which gave me just enough for a Cash+Points night in both HKG and NGO a couple nights later, so at least I had a night in luxury that evening. The flight down from CAN isn't the shortest flight I've been on, but it took long enough, the busy airspace between the two cities mean't we were circling HKG for quite a while before landing. I spent most of the evening walking around HKG as all my friends were occupied that evening. I stopped into the McD's in Jordan before walking back to the W, I don't know why I didn't eat it then, nor why I didn't get it from the McDonald's at the mall next to the W, but I guess it made sense at the time. It was approaching midnight, so maybe the mall branch wasn't 24 hours who knows what one things when jetlagged and tired. The promo photo from when it appeared in Singapore earlier this year. This was the first time I had ever had any of the 3 items, the Double Wasabi Filet-o-Fish seems to make it back to HKG about once a year. In September 2012, they also released the sauce on its own as a dipping sauce for nuggets (which my friend brought me from HKG, but I had a last minute business trip to London, and it broke in my luggage on the way over, and never tried). It even made it over to Singapore in February 2012. If it ever made it elsewhere, please leave a comment! 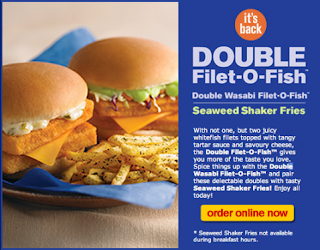 I like wasabi, so the wasabi/tartar sauce combo was pretty nice, and though I don't normally enjoy the standard, I really liked this variant, even though I never order the filet-o-fish burgers (Which just made me think, is Korea the only country that doesn't sell the filet-o-fish?). A more premium bun probably would have made it taste a little better, but it wasn't necessary. Unfortunately no receipt photo because it was in the pre-blog days, but I do know HKG McD's prices are always very low, so it was probably ~$4USD for the combo, even as a double with the special wedge fries. This also would have been the first time I had wedge fries at McDonald's. In Spain, I was able to have them with both of my meals, with the CBO, and the Pizza Melt Happy Meal, and I passed on the "American Fries" when I was in Germany. It was too long ago to remember how fresh they were, but from the photo they look pretty good, and I didn't complain about them on my Facebook post back then, so they were probably alright. 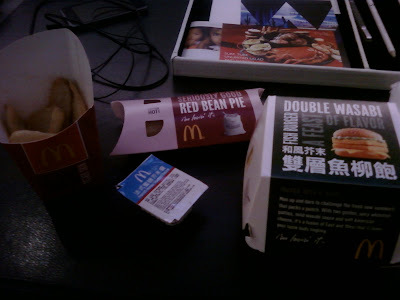 This was also the first time I've had a Red Bean Pie in Hong Kong. The 2nd photo at the top (with the Monopoly tray inlay) was from the 2nd time I was able to get the Red Bean Pie, in December later that year. Neither time I enjoyed it that all that much, but it is honestly not as gross as it sounds, much like the Green Bean Pie I had in HKG, it's very sweet, and not beany at all. Better photos are here, and here. 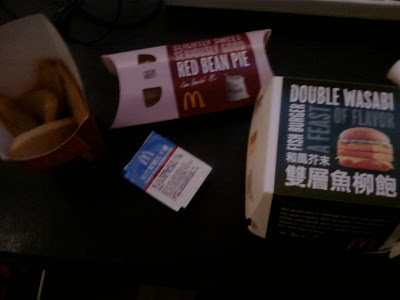 Update - Just saw after I posted this, that the Red Bean Pie is back for a limited time in HK! Perfect timing!